Directional couplers are four-port circuits where one port is isolated from the input port. Directional couplers are passive reciprocal networks, which you can read more about on our page on basic network theory. All four ports are (ideally) matched, and the circuit is (ideally) lossless. Directional couplers can be realized in microstrip, stripline, coax and waveguide. They are used for sampling a signal, sometimes both the incident and reflected waves (this application is called a reflectometer, which is an important part of a network analyzer). Directional couplers generally use the distributed properties of microwave circuits. The coupling process generally occurs within a quarter-wavelength or multiple quarter-wavelength portions of the device. In these distributed couplers the energy and fields of one structure interact with the energy and fields of another distributed structure, coupling signals from one to another. Lumped element and hybrid couplers can be constructed as well. These couplers do not rely on the interaction of the fields and waves between transmission structures to create performance similar to that of coupled line structures but instead rely on networks composed of independent (un-coupled) circuit elements. What do we mean by "directional"? A directional coupler has four ports, where one is regarded as the input, one is regarded as the "through" port (where most of the incident signal exits), one is regarded as the "coupled" port (where a fixed fraction of the input signal appears, usually expressed in dB), and one is regarded as the "isolated" port, which is usually terminated. On some commercial couplers the fourth (isolated) port is terminated internally or exterminally with a matched load - making a four port device seem like a three port device. If the signal is reversed so that it enter the "through" port, most of it exits the "input" port, but the coupled port is now the port that was previously regarded as the "isolated port". The coupled port is a function of which port is the incident port. New for January 2013: we will further describe the simple difference between forward and backward wave coupling. 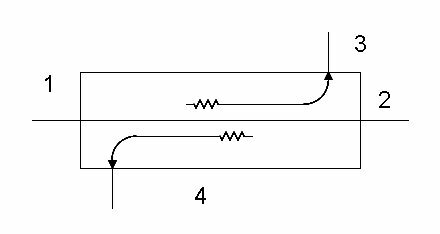 In the forward-wave coupler, energy that propagates down transmission line starts a parallel wave down transmission line 2 as shown below. The most common forward coupler is the multi-hole coupler realized in waveguide. In this case the holes are spaced a quarter wave apart so that the reverse wave cancels out. Flat coupling across a wide bandwidth is possible, using a lot of math to specify the sizes and positions of each coupling hole. Don't get hung up on the port nomenclature, there is no "standard" way to number the ports. We have used a clockwise notation and we will attempt to remain consistent, at least on this page. Also, there is no perfect coupler, in a forward coupler there will be reverse coupling to some degree, and vice-versa. Most waveguide couplers couple in the forward direction as they rely on multiple coupling holes; a signal incident on port 1 will couple to port 3 (port 4 is isolated in our clockwise notation). 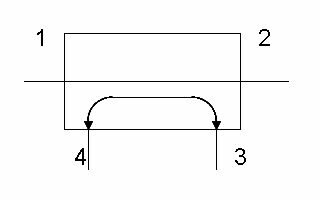 Microstrip or stripline couplers are backward wave couplers because they rely on coupled lines: for a signal incident on port 1, port 4 is the coupled port (port 3 is isolated in our clockwise notation). Forward couplers are in-phase couplers. Backward couplers couple in quadrature (the coupled port phase is 90 degrees more negative than the direct port). We attempt to explain why the phases are in quadrature on our coupled-line coupler page. The Narda coupler below is made in stripline (you have to cut it apart to know that, but just trust us), which means it is a backward wave coupler. The input port is on the right, and the port facing up is the coupled port(the opposite port is terminated with that weird cone-shaped thingy which voids the warrantee if you remove it. Luckily Narda usually prints an arrow on the coupler to show how to use it, but the arrow is on the side that is hidden in the photo. On the waveguide coupler below, the input is on the left, while the coupled port is on the right, pointing toward your left ear. There is a termination built into the guide opposite the coupled port, although you can't see it. Looking at the generic directional coupler symbol below, if port 1 is the incident port, port 2 is the through port (because it is connected with a straight line). Port 3 is the coupled port, and port 4 is the isolated port. For a signal incident on port 2, port 1 is the through port, port 4 is the coupled port and port 3 is the isolated port. Just follow the lines! The symbol below is for a forward coupler. Note: this paragraph was corrected in November 2011 thanks to Jim! Graphic Symbols for Electrical and Electronics Diagrams, IEEE Standard 315-1975. The equations are now in agreement with Pozar's Microwave Engineering, 2005 edition, page 313. Pick up a copy from our book page! So long as you note that a minus sign is required. Indeed, the upper set of equations were specifically written to throw away that minus sign! Note that directivity requires two, two-port S-parameter measurements, the other quantities require only one. Directivity is the ratio of isolation to coupling factor. In decibels, isolation is equal to coupling factor plus directivity. This topic has its own page. Bethe-hole is a waveguide directional coupler, using a single hole, and it works over a narrow band. The Bethe-hole is a reverse coupler, as opposed to most waveguide couplers that use multi-hole and are forward couplers. Any directional coupler is bi-directional, that is, it performs equally well when the signal is incident on port 2 versus port 1, but the coupled and isolated ports flip. All direction couplers are bi-directional, unless you terminate one of the ports. Consider the coupled-line coupler below. Port 4 is the coupled port when a signal is incident on port 1, and port 3 is the coupled port when a signal is incident on port 2. Here we have two couplers in series, in opposing directions, with the isolated ports internally terminated. 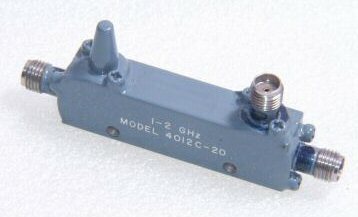 This component is the basis for the reflectometer. Using internal, well-matched loads helps remove errors associated with poor terminations that might be present in real systems. We'll analyze that statement one of these days. Oops, we have violated our clockwise notation rule below! A hybrid coupler is a special case, where a 3 dB split is desired between the through path and the coupled path. There are two types of hybrid couplers, 90 degree couplers (such as Langes or branchlines) and 180 degree hybrids (such as rat-races and magic tees). We have a separate page on this topic, click here! This is the component that allows you to measure S-parameter magnitudes using a network analyzer. You can build a reflectometer using a single directional coupler to form a reflectometer and two power sensors, but it is not recommended (use the dual-directional coupler you cheapskate!) A reflectometer allows you to compute the magnitude (and perhaps phase) of an unknown reflection coefficient that is presented to one of the ports. For example, suppose the sample was placed at port 2 and it was excited by a signal at port 1. The magnitude of the reflection coefficient (S11 in S-parameters) would be the ratio of power at port 3 to power at port 4, given that the coupler is a reverse coupler. Finite directivity can cause errors in reflectometry measurements, particularly if a load is not well matched. 40 dB directivity will have a very small error, 20 dB may be unacceptable accuracy.